Foxconn, the Taiwan-based consumer electronics giant, said Friday that it was committed to building a manufacturing facility in Wisconsin after a conversation between the company’s chairman and President Trump. Foxconn did not say when the conversation between Mr. Trump and Foxconn’s chairman, Terry Gou, took place or who initiated it. 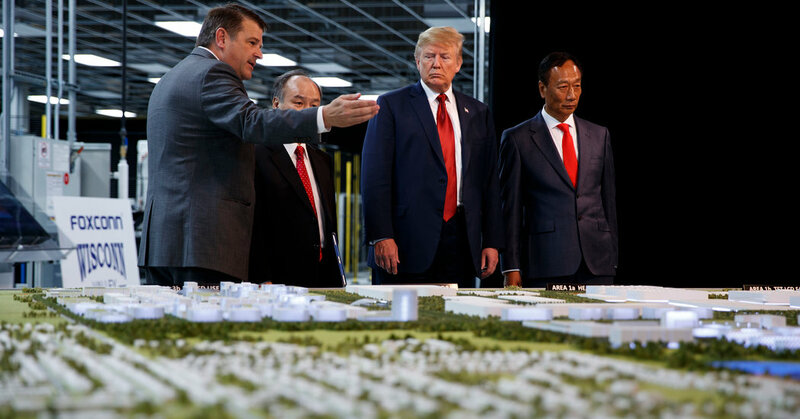 The development comes after a tumultuous few days in which Foxconn sent mixed signals about its proposed $10 billion facility in Wisconsin — an investment that was announced in 2017 by Mr. Trump at a White House event with Mr. Gou. It was not immediately clear how many manufacturing jobs the company would ultimately create and whether it would meet Foxconn’s original goals. The project, with a promise of 13,000 manufacturing jobs, became a focus of political contention in Wisconsin over the $4 billion in tax credits and other inducements that it involved over a 15-year period. On Wednesday, Louis Woo, the special assistant to Mr. Gou, told Reuters that the company was reconsidering whether it would make flat-screen panels at the site, citing the high cost of manufacturing screens in the United States. Mr. Woo later told The New York Times that while the company still planned to hire 13,000 workers, he expected that only 25 percent of them would be focused on manufacturing. “The remainder of our work force will be knowledge workers,” Mr. Woo said. Republicans, for their part, said the shifting aims for the plant reflected the election of Gov. Tony Evers, the Democrat who ousted the incumbent, Scott Walker, in November. “The company is reacting to the wave of economic uncertainty that the new governor has brought with his administration,” said a statement from the Assembly’s speaker, Robin Vos, and the Senate’s majority leader, Scott Fitzgerald, both Republicans. The company later insisted, in two statements, that it was not retreating from its plan to build a manufacturing facility, but was re-evaluating what products would be made there. Mr. Woo, the chairman’s special assistant, told The Times that “the global market environment has necessitated a reconsideration of which technology” would be produced in Wisconsin.